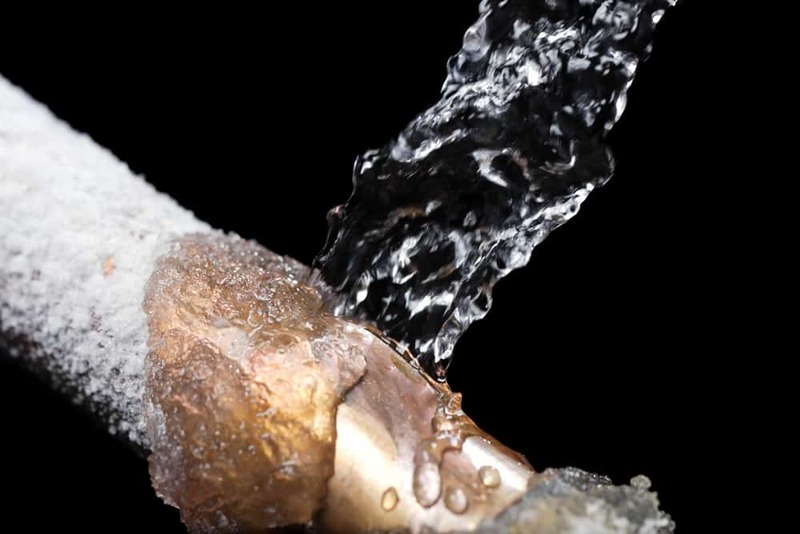 When a frozen pipe bursts, it doesn’t always burst dramatically. Instead, the actual leak might just look like a slow-running faucet. The thing about a home’s water supply is that it doesn’t stop running—so long as there is water pressure, the leak will continue to seep into the surrounding home. Anything that can absorb water will. Water damage to porous materials like drywall, carpeting, or upholstery will be immediate. Anything that is water resistant will probably start to take on water damage after repeated exposure. This includes the wooden studs and joists in your walls, and hardwood flooring, and anything else that could feasibly absorb water. The water damage might not present itself until the damage is too far gone. Much like the proverbial tip of the iceberg, by the time you actually see water damage, there could probably be even more extensive damage underlying the problem area. What’s more, as water damage spreads, it makes it harder to pinpoint where the source of the water is. Water damage can be quite invisible until it is too late. If for any reason you notice any dripping or standing water in a location it should be at, immediately look to determine the source of the leak. If you can’t, then immediately contact your local plumber in Columbia SC—or, if you are familiar with your plumbing, shut the water off temporarily. Your immediate reaction to water damage might be frustration at the unattractive remnants of your carpet, floors, or walls. And while we all want an attractive house (and it can be frustrating to find your home damaged and in need of repair), appearance isn’t the only thing to consider. When water settles into the fabric and wood of your floors and walls, it does two potential things..
First, it breaks down the material by allowing organic material to thrive. Wood especially will start to root and decay with repeated exposure to water. Over time, this can lead to weakened structures that continue to deter or irate over time, long after the water damage is cleaned out. Second, with the introduction of water you also have the introduction of harmful organic entities. Mold, bacterial, and virus-carrying organisms will find moist carpets, wood, and upholstery a great place to breed and grow. And, over time, that mold and bacteria will start to reproduce and spore, releasing harmful chemicals into the air. Mold in particular is a major problem after water damage. Black mold is known to grow easily in musty and wet conditions, and once a home has a mold infestation it can be difficult, if not nearly impossible, to completely eradicate without extensive renovation and a replacement of personal belongings. If there is water damage in your home due to a burst pipe, be prepared to replace a significant portion of the damaged material before you have any further problems. With extensive water damage, you’re going to want a restoration team in your home to take care of the mess. At a bare minimum, you are going to want a plumber who can identify the problem, locate the leak, and fix the issue. That same plumber should be able to tell you how to better prepare your water pipes and prevent freezing altogether. Hardwood repair or, if necessary, replacement. A company that specializes in water damage restoration and cleanup will be able to identify and remove contaminated areas that are, or will be, breeding grounds for mold. Many of these companies will also provide installation services to replace the flooring or upholstery that was damaged in the first place. Note that unlike other projects, this is not a place where you want to attempt DIY solutions. Restoration and remediation are professional grade-jobs that people are trained and licensed to perform. That’s because mold doesn’t leave unless it is entirely removed and eradicated. If you can’t know for certain that you have removed all the damage and all the possible contamination, then DO NOT attempt to do this work on your own. A burst pipe is a huge headache if not caught quickly. That’s why, when it comes up, don’t hesitate to call in the professionals to help. Find a remediation company that can help you remove any possible contamination and sign up with a carpet and flooring company that can handle water damage carpet restoration or offer water damage carpet cleaning services. Water damage restoration isn’t fun, but a competent water damage restoration company near you that knows what you need and can provide it quickly will make it that much easier for you.